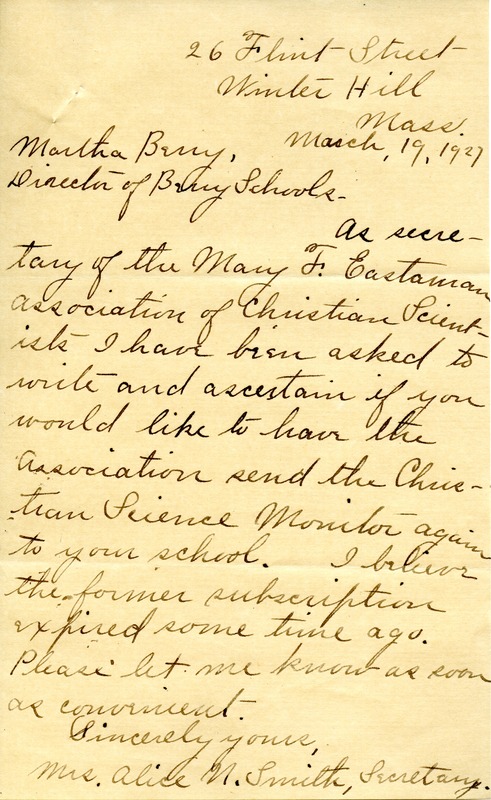 Alice M. Smith, secretary of the Mary F. Eastaman Association of Christian Scientists, writes Martha Berry to inquire if she would to have the Christian Science Monitor, a publication of her association, sent to the Berry Schools again after the expiration of the prior subscription. Mrs. Alice M. Smith, “Letter to Martha Berry from Alice M. Smith.” Martha Berry Digital Archive. Eds. Schlitz, Stephanie A., Chelsea Risley, Lindsey Purvis, et al. Mount Berry: Berry College, 2012. accessed April 22, 2019, https://mbda.berry.edu/items/show/5771.